At Easter time I am always especially thankful to be living in the northern hemisphere. Can you imagine how odd it would seem to have this day come in the fall? I realize that south of the equator people have flowers at Easter, and no doubt these seem as properly seasonal to them as ours do to us, but I cannot imagine that their greenhouses and shops are filled to overflowing with the lush assortment of flowering bulbs, bushes, and plants of all sorts as ours are. If you have never taken the time to visit a greenhouse at this season, do manage the trip this year: even the briefest time spent in these glass-enclosed gardens will fill you with sights and scents to last until summer fulfills spring’s promise. It saddens me, however, to think that these eagerly growing beauties should, like butterflies, be condemned to only a brief span of life when with a modicum of care and effort we could prolong their time among us by many years, or even grant them a few extra weeks, or days. No matter if they are transients by nature, these, too, can be encouraged to live out their lives in the full glory that belongs to them. If you have a pet dog, you see that it has fresh water whenever necessary; if a cat is your companion, you are probably choosy about what food it gets; if a bird brightens your home, a cage-cover as protection against drafts is as necessary as the cage itself. Well, plants are live things, too, and they need water and food and shelter from too hot or too cold breezes; yet how many of you actually give your plants the care they need? If you hope to be on the receiving end of an Easter plant this year, memorize the following advice; if you plan to give a plant, clip this article and tuck it into the ribbon bow on the pot. Bulbous plants are probably most closely identified with Easter, and heading the list is, of course, the sweet and lovely lily. Despite the fact that improved methods of cold storage have made possible the production of flowers of the so-called Easter lily at any season of the year, for me (as for most of the flower loving public) they symbolize Easter as no other flower can. Most of these lilies are types or varieties of Lilium longiflorum and force rather easily, making good outdoor garden subjects for future years. Few bulbs will lend themselves to forcing two years in a row, and most will “sulk” for a season or two even when grown under ideal conditions, but the Easter lily will not only bloom ahead of time in the spring, but the same bulb, set out in early summer, may well flower again before frost. To maintain Easter lilies in their full beauty for as long as possible, give them a very cool, fully bright window and ample water. When flowers fade, cut them off with sharp scissors, leaving the stalk until it withers naturally. When the leaves begin to yellow and look shabby, reduce watering until finally you are moistening the soil lightly only every week or two , then store the plant in its pot in a cool, dim, frost-free place (continue to water lightly at intervals to prevent the bulb drying completely) until the bulb can be set out in the perennial border. 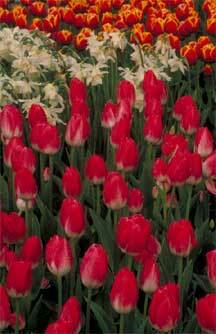 Tulips, hyacinths, muscari, daffodils and lilies-of-the-valley are other bulbous plants frequently forced for Easter flowering. 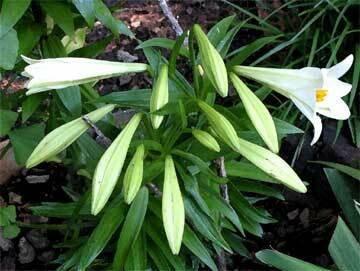 These, like lilies, need cool fresh air, bright light but little sun, and ample moisture. When flowering is through, nip off the spent blooms, mature the foliage for as long as possible, and store like lilies. When early summer comes, these too may be set out in the garden to bloom again another year. But have you ever seen an azalea that gave up the ghost long before it had finished flowering? Of course you have, and it’s a sad-looking thing, isn’t it? I’ve seen the same premature demise hit with exasperating suddenness at hydrangeas and roses and gardenias, and do you know what kills all these the fastest and most surely? Thirst… That’s right, nothing but plain old thirst. Their roots must have plenty of water available at all times, and if this is lacking, they are goners. You may have to water twice a day or more to satisfy these shrubs. For good measure on potted material you many want to immerse the plant pot in water for half an hour, just to make certain that the shrubby roots are thoroughly soaked all the way through. Increased humidity is always beneficial to these shrubs. If top spraying will not spot the blossoms, syringe the plants with tepid water each morning; otherwise, keep them in as humid a place as possible. They need cool conditions, and full light for best growing. Frequently I have read that full sunlight should be provided, but this often leads to leaf scorch, red spidermite, and bud blast which to me seems a high price to pay for best flowering and coloration; I would rather take my chances on having less perfect blossoming and end with a healthier plant. Most shrubs, forced for Easter or blooming normally at that time, may be set outdoors when the weather warms. Unless you live in a temperate zone, gardenias and the tender azaleas and hydrangeas will need to be brought indoors again in the fall; if your plant is a “fairy” rose, it may be left out for a brief dormant period before being placed in the window garden for the next winter. Although they are neither bulbs nor bushes, but blooming their heads (flower heads, of course!) off willingly or under duress, we find primroses, calceolarias, cinerarias, and the ever-popular chrysanthemums. I dislike chrysanthemums at Easter as whole-heartedly as I would resent Easter lilies at a football game, but who am I to go against millions of people who adore them at any season? Calceolarias are the plants with little pouch-like blossoms, highly colored and heavily spotted, while cinerarias are the large-leaved plants with daisylike flowers that look like a small child had worked them over with poster paints. These two are properly classed as “florist’s plants,” meaning that successful cultivation of either without benefit of a well equipped greenhouse is almost an impossibility. If these are yours to give or get, provide them with a cool, bright spot and ample water, enjoy them while they look nice, and dispose of them when they begin to fade. 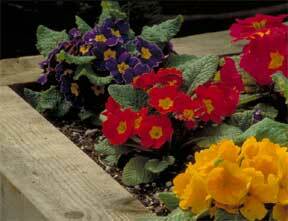 Most of the primroses in flower for Easter are tender, and cannot tolerate temperatures much under 50 degrees. These, like the bulbous plants discussed previously, need coolness, moisture, and protection from bright sun. They should, with proper care, continue in presentable condition until they can be set outdoors for the summer, and may even still look good when brought indoors ahead of frost in the fall. Chrysanthemums are reliable repeat performers, and really deserve far better care than they are usually accorded, I have had plants that were in flower for Easter flower again in late summer in the garden, not with blossoms of the same size and quantity, but satisfactorily enough to suit anyone. Give mums ample water, as much sun as they can stand without getting red spidery, and shower their tops often with tepid water. Keep faded flowers cut off, and remove unsightly leaves as necessary; then, when the plant has opened its last bud into full bloom, rest the plant in a cool place, or set it out in the border. Keep in mind these points to preserve the beauty of your flowering, potted plants as long as possible: use tepid water, and give water whenever the plants need it, but always check in the mornings and apply water at that time. Increase humidity unless you are fortunate enough to have above—average moisture content in your home. Keep the plants cool. Give them the brightest light possible, but avoid too much hot sunlight even for the natural sun lovers. Remove faded leaves and flowers promptly. Above all, check the plants every day to see that their needs are being met.